My medium of choice would be oil; however, I also incorporate elements of mixed media to add varied surfaces and textures to my paintings. My creative process involves the construction and deconstruction of the form and figure through a preliminary stage of drawing, collage and photography. This avoids the original references defining the outcome of the painting and instead striving to create work which is unique and unpredictable. I am interested in narratives and how texture, space and expression can convey a mood. In my work I attempt to capture the essence of the sitter and convey emotive qualities rather than simply replicating a photograph. Through painting I hope to capture a moment in time, some more fragmented than others. I am interested in capturing feelings of vulnerability and anxiety resulting in raw and honest portraits that aim to express underlying narratives based around both the sitter’s experiences and my own. Screaming Pope Prize finalist 2015. 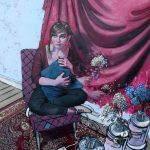 RHA Visual Artist Awards- Long list 2016. Screaming Pope Prize finalist 2016.